Destin Harbor provides true coastal living, daily relaxation and adventure all at one place. Destin is known as “The World’s Luckiest Fishing Village” and was rated the best place to live and boat on the Gulf of Mexico by Boating Magazine. 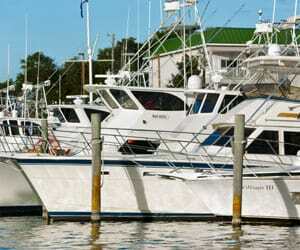 The Harbor is currently home to approximately 150 charter and fishing boats, the largest fishing fleet in Florida. Daily fishing trips provide sportsmen and family fun with sailfish, white marlin, blue marlin, wahoo, king mackerel, and a variety of tunas caught year-round. The Destin Boardwalk stretches nearly a quarter of a mile along the Destin Harbor, providing a variety of places to enjoy beautiful views of the Harbor, Gulf and Destin Pass. 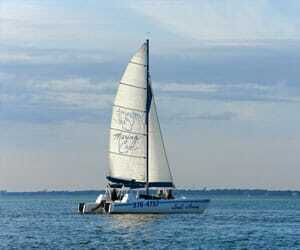 The Destin Harbor hosts several wonderful events throughout the year. Popular events include the Destin Seafood Festival and the Destin Fishing Rodeo in October. Each year thousands of visitors attend the festival and rodeo to enjoy family friendly activities, live entertainment and the fresh Gulf seafood. Duringthe summer, Crab Island, a large sandbar that is visible at low tide,is a popular spot for anchored boats, large floats and slides providinghours of family fun near the Brooks Bridge that connects Destin to Okaloosa Island. Watersports including jetskiing, kayaking, paddle boarding, wind surfing, and boating. Some ofthe best Gulf swimming, snorkeling, watersports and boating can be foundthe base of the Brooks Bridge at the jettys. HarborWalkVillage is a collection of restaurants, shops and entertainment alongthe board walk at the Emerald Grande. HarborWalk Village hosts manyevents throughout the year including weekly Fat Tuesday parades, Fineston the Emerald Coast, ArtWalk on the Harbor and many other festivals. Alongthe Destin Boardwalk and at HarborWalk Village, you’ll find a variety of restaurants ranging from casualto fine dining. The Nathan Abbott Team recommends visiting Jackacudas, a local’s favorite for freshseafood and sushi. Another Nathan Abbot Team favorite is Harbor Docks where fresh seafood is served straight from the Gulf to the table. To see what is going on at the Destin Harbor today, view the Destin Harbor live camera. This beachfront gated community provides guests with an incredible view of the Emerald Coast and the surrounding Destin area, with its 39-slip marina contributing special character to its pleasant atmosphere. Located on Norriego Point, which is part of Holiday Isle in Destin, East Pass Towers is directly on the East Pass. The spacious floor plans, extravagant balconies, and convenient amenities of provide a luxuroius beach stay. Waterview Towers is located on Holiday Isle in Destin. These upscale units sit on Destin’s beautiful East Pass the views are nothing short of spectacular. 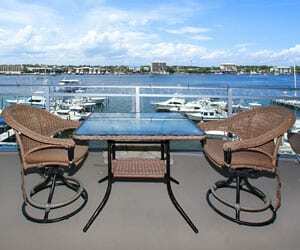 Each unit comes with two balconies, one faces the East Pass and the Gulf, the other faces the beautiful Destin Harbor. This 7-story condominium is nestled on the Destin Harbor with luxurious amenities and views. Units come with a climate controlled storage room and private 1-car garage with direct access to the interior corridor of the building. Boat slips are also available at an additional charge. Features include high speed glass elevators and two spiral staircases leading up to a common area highlighted with a kitchen, living room, library, and balcony. Sitting on 2.5 private acres with ~500 feet of water frontage, the gated community of Grand Harbor provides a community room, dock, exercise room, marina, pool and hot tub. Harbor Landing is the newest luxury condominium on the south side of the Destin Harbor. Two beautiful 12-story buildings offer 2 to 4-bedroom units ranging from 1531 to 3136 square feet. The unique floor plans feature panoramic views of the Destin Harbor, emerald waters of the Gulf of Mexico and the Choctawhatchee Bay. Harbor Landing offers many amenities including a 3100 square foot lagoon-style pool, kiddie pool, hot tub, free video rentals, fitness facility and a grilling area. Marbella is a luxury condominium featuring 2, 3 and 4-bedroom condos and penthouse units. Marbella does not allow short term rentals, makeing it an ideal first or second home on the Destin Harbor. Amenities at Marbella include a pool, hot tub, work out room, marina, lobby, meeting room, two parking garages below the building and guest parking out front. Boat slips can be purchased or rented. Marbella owners also have the option to join the on site boat club. Situated in the heart of the Destin, near Henderson Beach State Park, Crystal Beach features renowned restaurants with delicious dining and award-winning beaches. The private homes, cottages and condos in Destin’s Crystal Beach area are conveniently located near an array of shopping. If you want to invest in a Destin Harbor property, the Nathan Abbott Team is here to guide the way. View available Destin Harbor properties or contact our Buyer Specialists at 850-812-3261 to schedule a consultation.